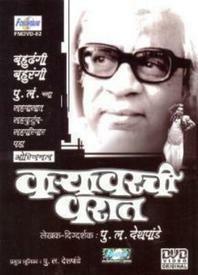 Yesterday I had been to 'varyavarchi varaat' at Prabodhankar Thakre theatre for the night show. The show started at 8:45 and ended by 11:30. I must confess I am beginning to enjoy these night shows. The air is much cooler, you are more relaxed, you are done with your dinner & the only thing left to do when you get home is SLEEP! Coming to the main point: the play. It is a play which was originally written & directed by Purushottam Laxman Deshpande or better known to everyone as Pu.La. The music too is by Pu. La. & the producer is Anant Panshikar. Its a two part play. The first part before the interval has 3 stories or experiences of Pu. La. Initially Pu. La. (his look alike) comes on stage to warn the audiences that this play is just for fun & anybody looking for great literary values or like in the play are obviously at the wrong place. He asks everybody to laugh & enjoy & keep their logical selves away for the duration of the play. The first story: This is a satire which highlights how people pretend to be super aware but instead are just superficial. Pu. La. was once invited as a chief guest for a 'Sahitya Sammelan' at some village. A representative from almost all organisations (wrestling, ladies club, schools, etc) is there to greet him. However the only one missing is a representative from the 'Sahitya Sabha'. The chief guest is greeted with a 10 inches long garland. However the organizer is greeted with a garland almost double in size & flowers. The second story: Pu. La. once had a wish to watch a 'tamasha' in a village. Hence he arrives at some village in Konkan. However much to his surprise, tamasha has long left villages & reached 'Bam-Bay'. Even the villagers think him silly for coming to a village all the way from Bam - Bay. In the end the only thing he gets to see is a few dances done by locals on film songs which they wish to see at a theater in Bam-Bay at the earliest. The third Story: It is about a witness in court. This was the most boring part of the show. The main story was stretched unnecessarily. The entire Ramayan was put in here to bring out the fact that some people speak too much & hence are way out of context. In the end the witness proves useless because the witness has seen the setting but not the actual happening. A Sunday at home: The last part is one story entirely. Its a typical Sunday spent by any working male (the hero) at home. He wakes up as late as possible. His only wish for the day is that he can spend it playing his Harmonium. However the wife has other plans for the poor soul. She keeps on nagging him to have a bath as she has invited 2 of her friends over. The phone keeps on ringing continuously. In between the wife's constant nagging & the telephones incessant ringing the hero determinedly keeps on playing his harmonium as & when he finds time. He is joined in this by his friend who plays the Tabla. As soon as the wife leaves for the market, the hero gathers some of his friends from the chawl & then starts their very own mini concert. The Harmonium & table pieces that are played are just excellent. They are soothing. The jugalbandi between the Harmonium & the singer (hero's friend) is just too good! After these guys leave the heroine has her friends over. Subconsciously I was comparing the friendship between men & women here. The men gather & enjoy some light moments in spite of daily pressure (wives, baths, getting vegetables from the market, etc). However when the 3 women meet all they can do is show - off, compare & criticize. Guess being a man does have its positives! The show ends with a beautiful musical piece on the Harmonium. The music played is just too good. Once after the show was over, Pu. La. was asked by a friend, cant you ever write anything serious? All you write is comedy. Pu. La. replied, I take comedy very seriously! Once at NCPA the cast was asked why dont they introduce the cast members alongwith the character names. The cast had replied, when we are on this stage we are no longer individuals. We all are Pu. La.! My Take: Worth watching once. For me, what made it worthwhile were the Tabla & Harmonium pieces which were played after the interval. I soooo loved them! The actors are all naturally very good. The best among them however are Vighnesh Joshi, Atisha Naik & the actor who played Pu. La. All 3 were outstanding! The jokes are fresh; though how when this has been going on for the past 50 years, I have no idea of! There is no exaggerated or cheap comedy. A 4 / 5 from me just for the Harmonium & Tabla! However, more important than my opinions are those of the general audiences. The name Pu. La. commands great respect from everybody & anybody who is a Maharashtrian. And that was obvious right from the start of the show. The person playing Pu. La. was perfect for the role. It wasn't handed over to some untrained amateur. The role was respected by the actor. Throughout the play you could hear mothers whispering to their kids......I saw this play first at XYZ theatre........Pu. La. used to play this role when he was doing this play..........the actor who plays the old teacher today is Shrikant Moghe & he used to dance in the second story of the play like Shammi Kapoor. My mother too shared her special memory with me of this play. She had managed to secure a first row ticket for this play. Her father loved to play the Harmonium & had been over the moon to hear Pu. La. play the Harmonium & that too getting to hear it from the first row! A person can go on & on about Pu. La. but my mother summed it up pretty well. While coming back in the rickshaw she said: after Atre, we had Pu. La.....but now after Pu. La. we have no one! P.S. : All 11 parts of the original are available on youtube! And I so plan to watch them. Already heard the Harmonium played by Pu. La & must say now I understand perfectly why they say original toh original hai!! !